If you guys have seen our nail polish collections then you know we have a lot of polish!! We decided to try the 365 Days of Nail Polish to try and use all of our polishes at least once. Let's be honest: We all have those polishes we bought, added to our collection, and haven't touched since. For Day 1, Tracy is wearing Claire's Candy Shop which Stefanie has done a blog post on. 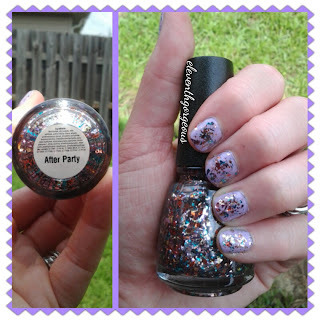 Stefanie decided on a similar glittery look wearing Sally Hansen Lacey Lilac topped with The Icing After Party. For Candy Shop, I went with three coats to add extra sparkles! It applied super easy, but I'm terrified to take it off! Glitter polishes are the worst! After Party is a really pretty flakie suspended in a clear base. There are gold, purple, orange, and teal colored flakes. We love it over this lavender polish from Sally Hansen. It took two coats of SH and two coats of AP to get this look. If you like seeing our nail polish, be sure to check us out on instagram, too!! Our username is eleventhgorgeous! Do you use "the foil method" to remove glitters? Us nail bloggers swear by it! Soak a cotton ball in straight acetone and put it on your nail, and wrap that finger in a strip of foil. (do this on all the fingers of one hand) Let it sit about 10 minutes or so, and the glitter polish will slide right off! We've heard of that method, but haven't tried it yet. Usually we just get a nail polish remover jar and keep our nails submerged until the glitter comes off. Might have to start doing the foil method though if we're going to be doing 365 days of nail polish! Yes, I just use the "scrubby tub" method for non-glitter polish. The foil method makes a huge difference- trust me on this!